The Verilog files as well as a completed working schematic can be found in Examples/Verilog-HDL/Tutorial. The following assumes that you are already familiar with the basics of entering a schematic and running a simulation. Open a new empty schematic sheet. In general it is strongly advised to save the schematic sheet before using the automatic Verilog symbol generation scheme that we are about to demonstrate. This is to ensure that the file system paths of the schematics and Verilog files are kept correctly synchronised. Select menu Verilog > Construct Verilog-HDL Symbol. You should see the file clock.v listed. If so select it then click Open. If you don't see the file, make sure you saved the schematic to the correct location in step 2 above. If you find that this menu is not present, then this means that the Verilog simulation facility is not available with your version of SIMetrix. You will probably need to upgrade your license, contact sales or support for assistance. You should see an image of a symbol appear. Place on schematic in the usual way. Double click the pulse_relay device (probably U2). You will see a dialog box showing a number of parameters. We aren't going to change any settings, this is just to point out this feature. You should see two parameters at the bottom of the top section called 'divide_ratio' and 'duty'. These are obtained from the Verilog file pulse_relay.v. Connect the rest of the circuit as shown in the diagram above. S1 is a regular switch from menu Place > Analog Functions > Switch. Make sure you don't forget the ground symbol. Select Gear integration using menu Simulator > Choose Analysis then click on Advanced Options... and select Gear Integration under the Integration Method group. We do this to tidy up the response of the circuit, this is by no means essential. Run the simulation in the usual way. It should take about 1-2 seconds maybe a little longer on an older machine. You will notice that at t=0, the voltage is between 4 and 5 volts suggesting that the switch is not fully turned on or off. This is because the output of U2 starts in the unknown state. The unknown state is translated to a high-impedance which leaves the output in a near floating state. To calculate the DC operating point, SIMetrix takes the port values after the first Verilog event which is the state after executing the init block. In the Verilog design the output is the port but you will notice in pulse_relay.v that is not defined in the init block. Rerun the simulation and notice the change in the result at the start of the simulation. Have a look at the connection between U1-clk and U2-in. This connects two Verilog signals but does not connect to any analog part. Because of this, it is implemented within the Verilog simulator and does not interact with the analog simulator. Although the node is not connected to the analog simulator, its data is sent to SIMetrix so that it can be plotted. Try plotting this node now; you will notice that you get a digital plot with no analog detail. Note the time that the last run took using menu Simulator > Show Statistics. 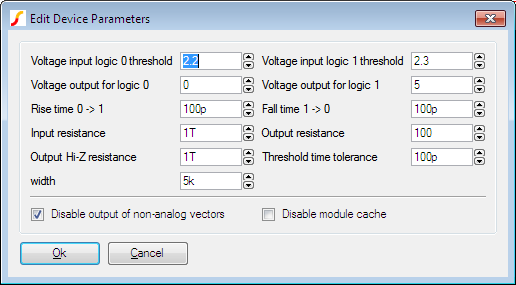 Check the Disable output of non-analog vectors box then click Ok.
Rerun simulation and note the new simulation time. You will probably see in the region of a 2-3 times speed up. You may conclude from this that the facility to retrieve pure digital data is too expensive to be worthwhile, but this will only be the case where the digital signal are considerable higher speed than the analog signals. In this circuit the analog pulses are running at 10Hz whereas the digital pulses are running at 100kHz - 10000 times as fast. As a further exercise, you may like to see what happens when this node is connected to an analog part. 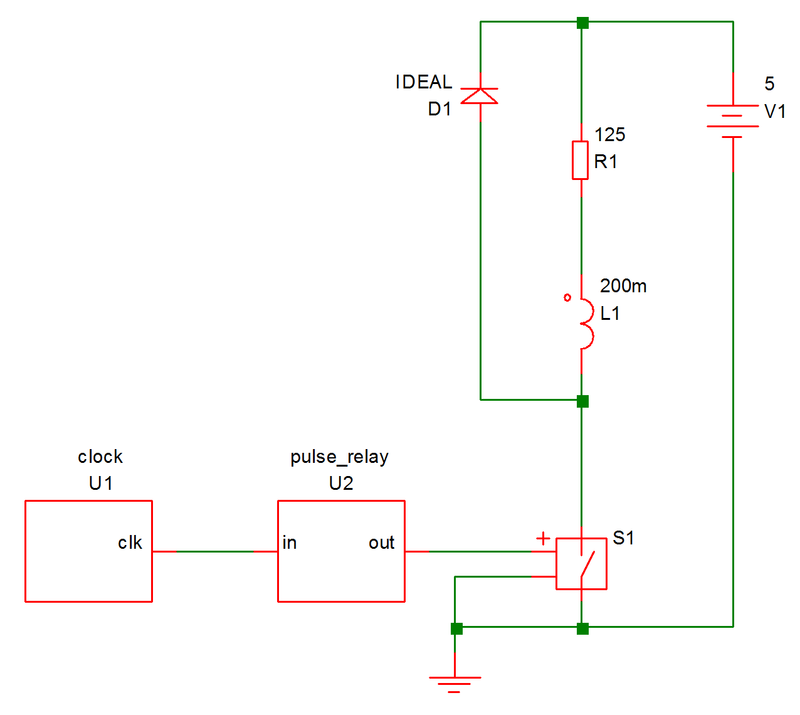 Try connecting a 1pF capacitor to ground and run the simulation. You will find that the simulation runs maybe 100 times slower. 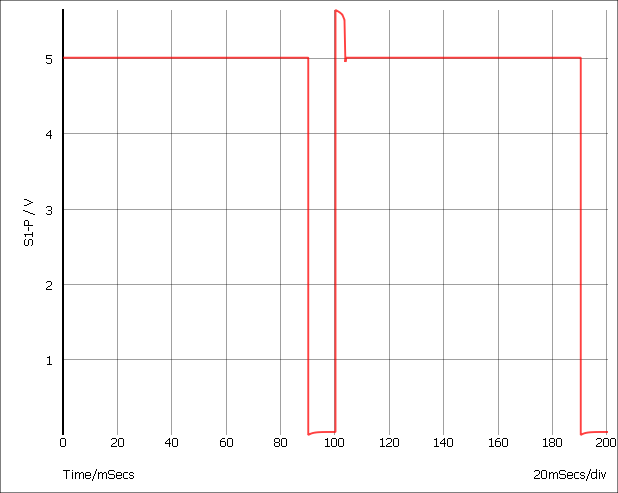 This is because analog time steps is now being performed for this high frequency signal. With just the 10Hz output to deal with, the analog simulator needed to perform only around 200 timepoints. Now it has to work at 100KHz it needs 1 million or so. Open the choose analysis dialog box. In the Transient sheet, select Enable multi-step then click Define. In Sweep mode select Parameter. Set Start value and Stop value to 100m and 500m respectively. Set Number of steps to 3. In Parameters set Parameter name to duty. Ok dialog boxes. If you carried out step 5 in the previous section Internal Verilog Nodes, remember to remove the capacitor and restore the connection between U1 and U2 to an internal Verilog node. Run simulation then plot relay drive as before. You should see three curves.